Content and SEO: two huge aspects of online marketing that go hand in hand like peanut butter and jelly. It’s highly unlikely that you’ll experience working on one without the other. After all, Google isn’t going to know what you’re trying to rank for without an effective strategy in place that includes both aspects. 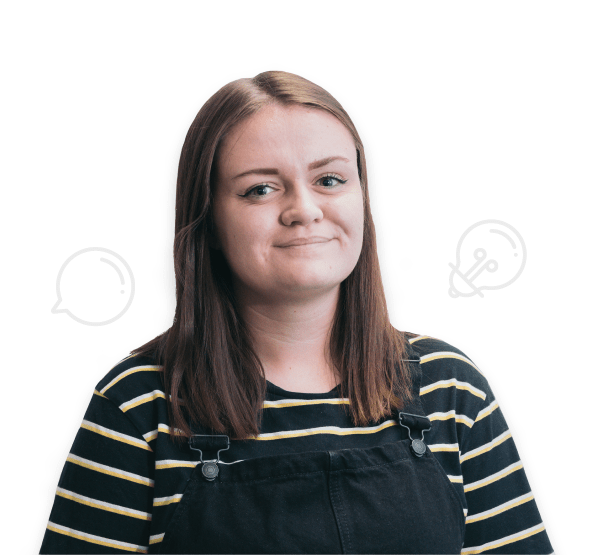 Not to mention that users aren’t going to spend any time on your site when there is no content – it’s like trying to build something fiddly with no instructions! As a digital marketing agency, we understand how overwhelming it can be to plan a content strategy with SEO in mind, which is why we have put together these simple yet extremely beneficial tips for all of you trying to get the most out of your content marketing. Before you even begin putting pen to paper (or fingers to keyboard), you need to establish who you are trying to target within your content strategy. It’s all well and good creating content, but you made it for a reason; if its not converting, then its not doing its job. You’ve probably already got a good idea of your target audience due to other strategies carried out in the past, but do you know the content they like to consume? How about the hours they’re active online? Do they prefer chit-chat or formal posts? It is essential to establish what the habits of your audience are, as this will be the first hurdle to cross when planning your content strategy. You could create the most SEO-rich content around, yet have no audience to share it with if you aren’t engaging with them properly. Never forget that you need to make a reader feel like your content was written for them – and only them. Now you’ve got a clear understanding of the audience you’re targeting, you need to set goals for your content strategy. For example: ‘to increase overall traffic by 200%’ or ‘increase number of sales over a certain period’. Having clear goals will stop you (or your team) going off on a tangent and losing sight of what the content was meant to about in the first place. Having these goals will help you begin to get a brief idea on what type of content to create. This leads nicely into the next point, topics, where SEO starts to play its beautiful part. When planning a content strategy with SEO in mind, many marketers make the mistake of focusing all of their attention on the keywords used, rather than the actual content itself. This is a massive no-no in the content marketing industry, as you’ll soon find yourself with content that makes no sense whatsoever. Not to mention it’ll also be incredibly unnatural, which Google will spot from a mile off. This doesn’t mean that you should disregard keyword research altogether, but rushing to place as many keywords as possible is not the way to go. It’s all about strategic planning. If you’ve followed the first two steps, then coming up with topic ideas for your content should be pretty straight-forward. With your goals and audience in mind, we recommend noting down a variety of short and snappy topics that your readers will want to engage with. Don’t forget to include the main keyword you want to target or a suitable alternative that relates to the content. If you need help with ideas, then there are plenty of tools out there which provide you with topics in an instant. A personal favourite of ours which keeps us a productive agency is Buzzsumo. If you’re looking for hot content and inspiration, then this tool will very quickly become your best friend. As you can see above, Buzzsumo has provided me with the most popular topics for the keyword ‘productivity hacks’. Here, you can see that the most popular topic has had a total of 23.3k engagements, with the majority of shares coming from Facebook. This has instantly inspired me for my next content campaign based on productivity! Now, before we get impatient, it’s finally time for keyword research! Keyword research is really straightforward on SEMrush, and probably one of our most favourite tools to use. 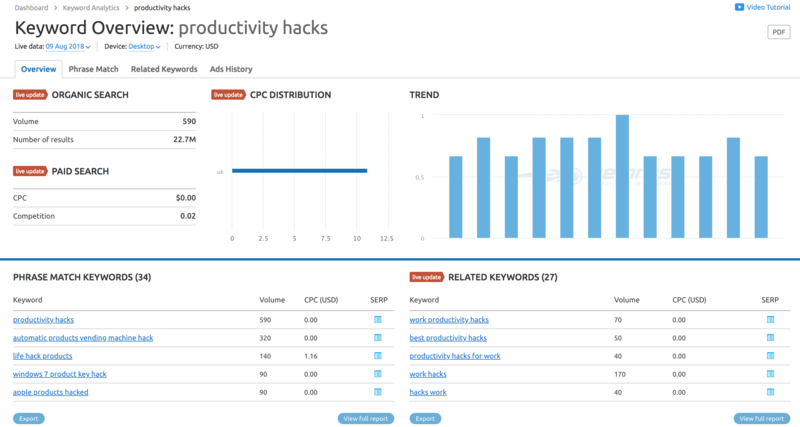 By simply typing in the keyword ‘productivity hacks’, you’re presented with metrics for that keyword, as well as phrase match keywords and related keywords. You’ll be sure to find the perfect keywords for your content with the help from these tools. So, with these four tips in mind, you’ll be ready to create some content that both search engines and readers will love! Oh, one last tip! Google absolutely loves fresh content, so it’s worth creating a content calendar to ensure you’re always in the eye of your audience and search rankings. Good luck!